Here are my five lessons learned after not having Internet access. Last week after the stormy weather that blew into Victoria and onto the rest of the southern part of Australia, interesting things happened with our utilities. I have been with Optus for a little while now and having cable means that my phone line and internet are tied together. Hence, if there is a phone dropout it means we can only use our mobile phones in case of an emergency. This lasted roughly from 12.00 Midday on Tuesday to 2.51pm on the Wednesday. Now, to most people this wouldn’t be a problem, except if you run your business online. And then, it can be an issue. I think one of the main things that does happen with technology is a reliance to a certain extent. I read the other day in a Sydney newspaper of a young boy who had become violent due to the banning of a certain computer game (I am sure it was probably Minecraft) or a similar game. Like with anything in life, there has to be a balance. 1. I felt disconnected from the world. There is a background story to this though and it goes something like this….When I had my first child back in 2008, I had been teaching for nearly 6 years. To be surrounded by nearly 120 staff and over 1000 students within a school, meant you never got lonely. School holidays were different (and then you wanted some peace and quiet and time to reflect before starting the term again). However, what nobody warned me about was the social isolation that came with having a newborn child. It was interesting hearing research lately that social isolation or lack of contacts with other people is causing more problems in society than drugs, alcohol or even obesity. I didn’t really use Facebook back then, but I did use Twitter @megsamanda. At school, I had access to newspapers and knew what was going on in the world. At home, I no longer had access to newspapers and dinner time was often around the time of the news. Twitter became my lifesaver to the outside world especially ‘professionally’. I had been involved in technology and training teachers how to use iPods in the classroom. During the time I was off on maternity leave, there were lots of new changes especially with the introduction of the iPod Touch and the world of ‘Apps’. At the end of 2009, I started training again and running workshops but the professional learning curve was so steep. In all honesty, without Twitter and the use of my ‘PLN’ otherwise known as a Professional Learning Network, there is no doubt ‘Tech Coach HQ’ would not be in existence today. Email, Twitter, LinkedIn, Facebook, Pinterest and all the other ways I communicate were shut off for the time that the Internet was disconnected. What I did notice, was that I started projects that didn’t require Internet to operate (such as recording videos for my YouTube channel). The other thing I got back into was reading my much loved novels. 3. Would anyone notice I wasn’t there? I remember trying an experiment about a year ago with switching off Facebook for a week. Often with communication, it’s mostly done via Facebook, email or text. I have a few friends who will physically make a phone call, but otherwise it’s via those channels. 4. I learnt where my time leaks were! 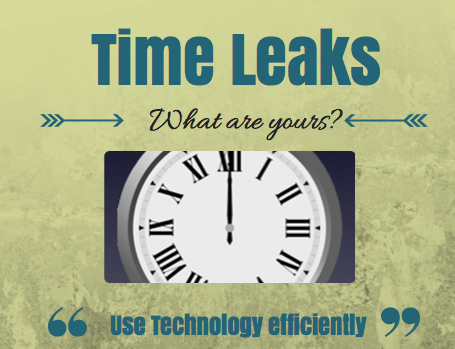 Ever noticed where your time leaks are when using technology? While I have been writing my book (it is getting there slowly) I have been deliberately turning off social media and emails so I don’t get distracted. I had time to reflect over that 24 hour period where I was wasting my time. I also discovered some great apps such as http://rescuetime.com/ which actually tracks the time you spend on certain apps and the Internet and then generates a report. 5. I focused on my family and ‘me time’. Again, time leaks came to the forefront especially at night time when I was watching (ok, attempting to watch the TV shows my husband had on)! 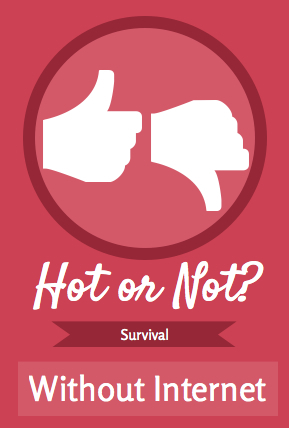 I often multi-task and research for presentations or add to my Pinterest collections all in the name of research. I have really tried lately, to put the iPad down at night time and just spend quality time with my family. If i need to work say after 8.30, then I will do that, but trying to make a difference in my own life and be ‘aware’ of things around me. 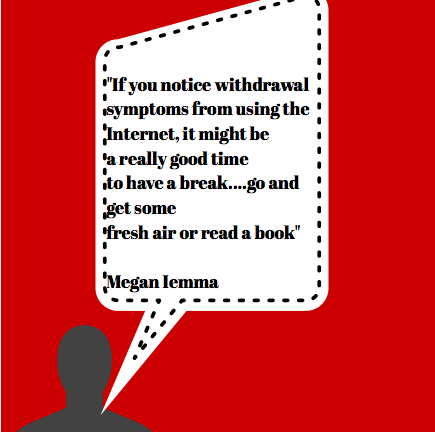 Have you ever had withdrawal symptoms from not using social media or the Internet or even your mobile device? Share your experiences below.